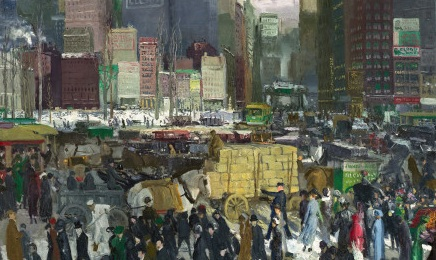 New York, George Bellows, 1911. Oil on canvas. Image courtesy of National Gallery of Art, Mellon Collection, Washington, DC. I love when folks ask me how I came up with the name for my business. My penchant for city life began when I was in junior high school and our class took a trip to New York City. I remember being in awe of how exciting every single moment felt, from seeing the Statue of Liberty for the first time to simply crossing a busy city street. Since then I have visited and stayed in Manhattan and its boroughs countless times; I spent a summer living in Paris and traveling France; and I lived in our nation’s capital for nearly five years (truly a significant part of my story). While I love great cities, it was after leaving Washington, DC to return to my hometown in Delaware when I realized that living in a city just wasn’t for me. I never really knew how much I missed, and needed, the freedom and peace that comes from space - that is, country fields, backyard gatherings with friends, and just a simpler, uncomplicated, way of living. My family is from Goose Creek and James Island in South Carolina, both just outside of historic Charleston. I spent nearly all of my childhood summers there visiting my grandparents and extended family. So while the majority of my twenties involved exploring and living in cities, I have always been grounded in settings outside the city, in southern sensibilities and simple joys. 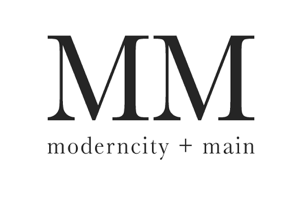 The first part of the name, Moderncity, comes from the concept of modernity - an idea or movement perceived as progressive (modern) with regards to an otherwise traditional (some may say antiquated) manner of being. The term is often used with regard to shifts from rural to urban areas, specifically those in the 19th Century; while there were significant negative effects of these shifts, or urbanization - displacement, for example - the creation of major cities paved the way for the development of urban culture and modern thought. While arguably the term originated and is still used to describe movements as far back as the 1600s, the idea of modernity represents an analytical challenge to otherwise stale ideas or ways of existing. The second part of the name, Main, comes from my southern roots and suburban childhood and by extension, an appreciation of small town main streets. America was built by small businesses and big dreamers. Even today, I believe, our society is made better by the efforts and determination of small business leaders hoping to make their mark and encourage compassion for, and connection to, each other.